Put your stability ball against the wall at roughly chest level and lean into the ball. 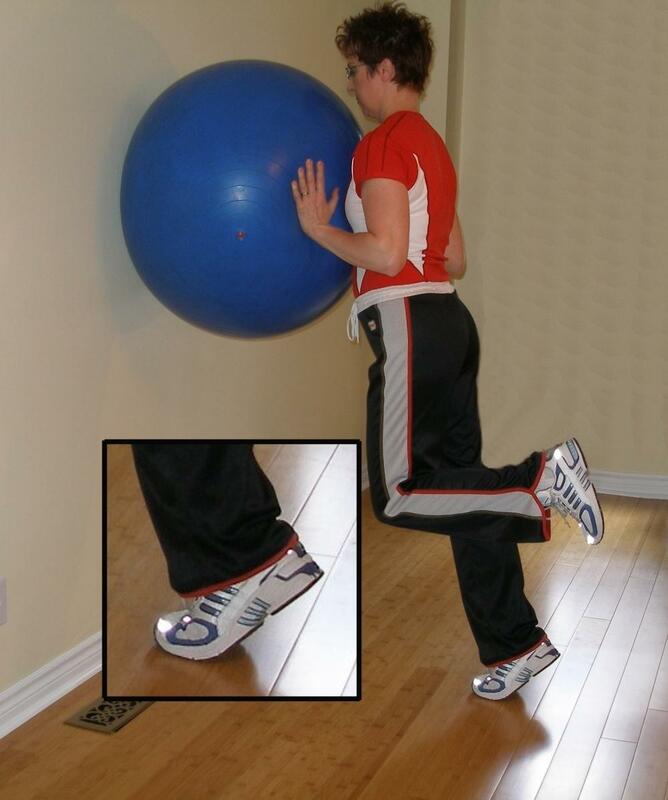 Place your hands on the ball at chest height and stabilize the ball against the wall. Take a step away from the wall and raise one foot off the floor. While keeping your trunk stable and your chest up, slowly raise yourself up as high as you will go onto the ball of your foot. Lower yourself to the point where your heels touch the ground and repeat on each side. If this is too difficult, try the Calf Raise 1, and Calf Raise 2. Try moving further away from the ball to increase the range of movement and reduce stability stability. Repeat this exercise ball exercise 10 times on each side. Repeat this exercise ball exercise 20 times on each side. Repeat this exercise ball exercise 30 times on each side.